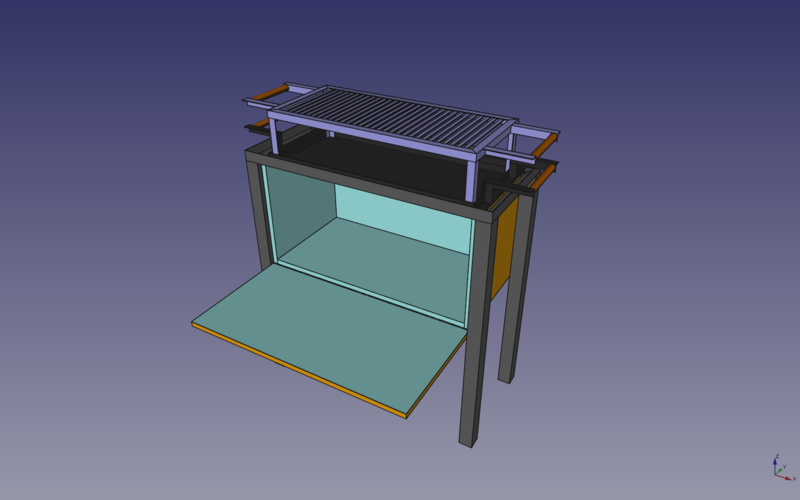 Im exited, this is my forst job in FreeCad, a grill im making for spending some time with friends. Ima post a photo when I finish making the real one ! here my latest reverse engineered piece of equipment. This is the twin cable operating mechanism of the carburetor Weber 40/45 DCOE that used to be manufactured many years ago by Chris Montagues car assessory firm under the name of TIMAVO. The firm has since long gone as has Chris himself, I am afraid. The last picture shows the device with the DCOE but that was not done by me but by a guy on grabcad. So I did not have to reinvent it but still it is a very nice example of reengineering itself. The linkage was done with FC 0.16 because I work a lot with the Part Design WB and the new PD does not suit me that well.... I tried to use PD next but when I got lost with the new features I returned to what I know. Last edited by r.tec on Mon Jul 16, 2018 1:58 pm, edited 2 times in total. That's a cool project. Did you use shaise's Sheet Metal workbench add-on to model the sheet metal box? fine you like the design. Yes, on some of the bended sheets I used indeed Shaise's WB. I really love this workbench although I still have not used all the features it has. PS: I noticed a little mistake in the first part of the sheet, and when I have rectified this I will post the download here. But I sill have some troubles with the bow. Looks like this will be produced? If yes some images after that happens would be nice too.